I had a very productive couple of days at the Digital Lending & Investing conference at the New York Sheraton last week. 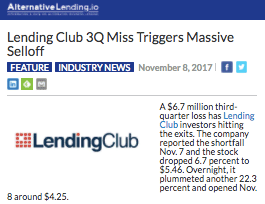 It immediately yielded three stories for DealFlow Alternative Lending Report — and one of those led (by sheer, dumb luck to be honest) to a rare breaking news story. I’m basically a back-of-the-book thinkpiece writer, but it’s fun to get a scoop every now and again. Still, I don’t know where everyone else was looking. When the largest publicly traded business of its kind loses one-third of its market cap in 24 hours, you don’t have to dig deep. You just need to have your eyes open. Also, my first piece in 20 years made it into Global Finance magazine last week. When GF was just starting out — and I was too — there weren’t a ton of journalists in New York who knew how to use Excel, so they retained me to do league tables. Then, for quite some time, I held a full-time job in another industry and let most my freelance work slide. Now that I’m writing for a living again, it’s great to be back with one of my earliest clients. I’m wrapping up a ghost-blogging commission today, then I’ll start cranking out an investment newsletter for a group of professionals planning for retirement. That’ll be steady work for the foreseeable future, and it looks like I may have networked from that into editing an econometric newsletter. Meantime, I’m also about halfway through writing a script for an online test prep series for a confidential client.